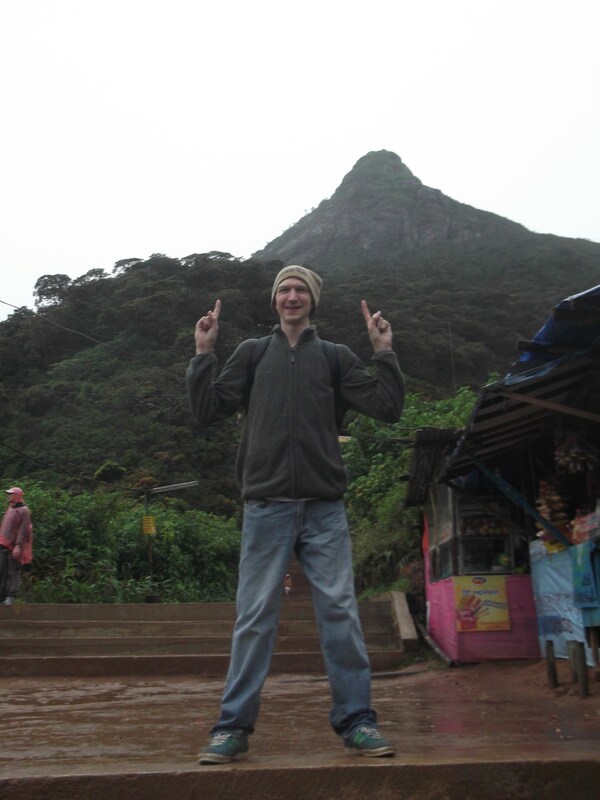 Hiking to Adam’s Peak (otherwise known as Sri Pada) in Sri Lanka will always be remembered by me. 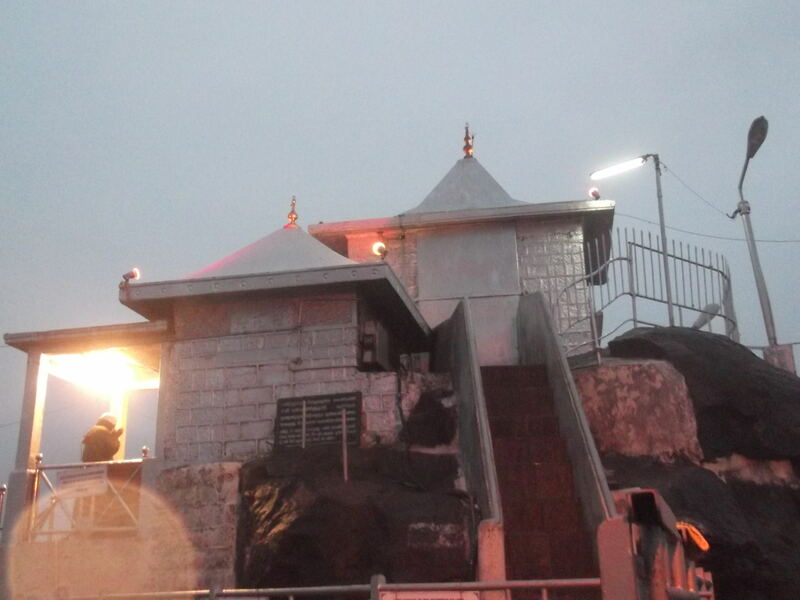 It was a night time hike, climbing up endless stairs which get steeper as you near the top of this sacred mountain in the Hill Country of Sri Lanka. It’s not what you would call an easy hike, given it’s at night, it’s steep and it’s seemingly endless. Indeed I expected it to be a bit easier, that’s all. But I did it and even more impressively my Dad did the hike with me!! This is a bit more of a personal post than normal as my Dad just turned 64 (cue the Beatles song) this week and for him to hike to the top in somewhat poor conditions was a remarkable achievement. A big thanks to my Dad for accompanying me on the hike and well done! Here’s an overview on hiking to Adam’s Peak, which is also one of the best sights according to the Sri Lanka Travel Blog. Adam’s Peak/Sri Pada near Dellhousie in Sri Lanka! An epic but challenging hike. It’s up in Sri Lanka’s hill country and the mountain roads are not easy to navigate or drive on at night, so the best advice is get there in daylight. A bus should drop you of in the main square in Dellhousie. As I was with my family, we had hired a car for this part of the trip which was great, and our driver Iraje was a top lad. 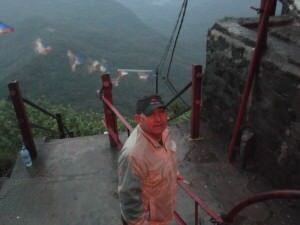 My Dad in Dellhousie near the beginning of the Adam’s Peak hike in Sri Lanka! 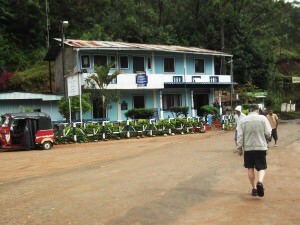 The best place to stay is the mountain village of Dellhousie, in fact I’d say this is the only place to stay really! There are a load of accommodation options in Dellhousie but do keep in mind that it gets popular at certain times so you may need to book in advance, January and February are the busiest months. We stayed at the White House Hotel which was excellent. They provided food and drink as part of the cost of a night’s stay. By the way you only need to spend one night here – do the hike and then leave. There’s not a great deal else happening in or around Dellhousie. 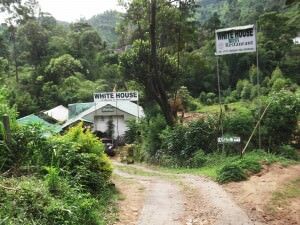 The White House in Dellhousie where we stayed – great place. If you really need, there are stalls on the way up selling tea, drinks and snacks available along the side of the path. But you’ll pay a bit more for it. I didn’t buy anything at said stalls, and you don’t need to. 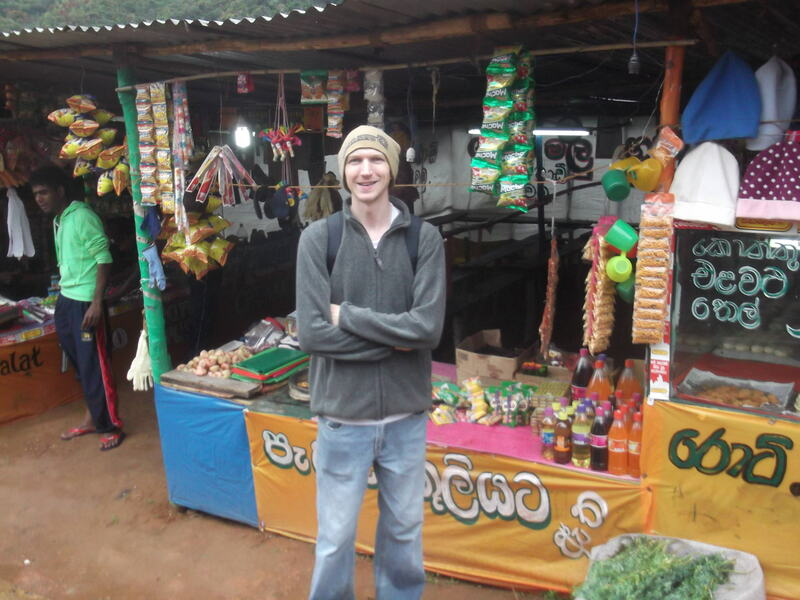 There are plenty of stalls on the way up to Adam’s Peak. The night before you will have a good feed at the hotel and get an early night. Try to be in bed before 9.30 pm or 10 pm. You’ll be awake at 2 am to start the hike. My Dad and I even managed to have a beer the night before the hike, which either relaxed us or at least made us have a decent few hours sleep (which is all you’ll get). Our massive feed in Dellhousie the night before hiking to Adam’s Peak/Sri Pada in Sri Lanka. OK so as a guide, this was our rough timeline for hiking to Adam’s Peak, you can leave a bit earlier if you like. 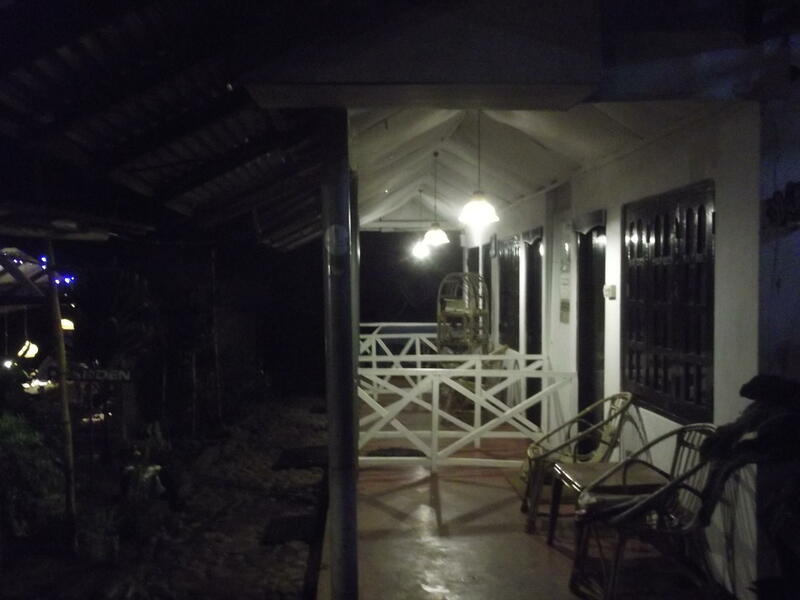 2am – Waken up (option to have tea, coffee and biscuits before starting the hike – we missed it sadly). 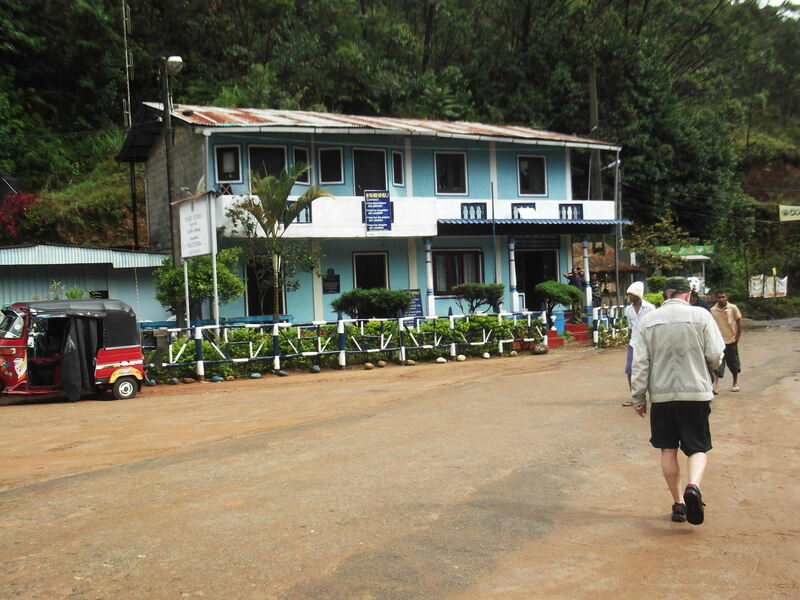 It’s an early start to hike to Adam’s Peak – you’ll be up at 2am! 3am – By this time you should have walked all the way through the village of Dellhousie and be at the foot of Adam’s Peak. You will see an entrance gate, a sign and eventually you will see the top of the mountain on your way up (our view was through mist). 4am – It’s just a continual ascent I’m afraid – there is no straight bit on the hike – it’s up, up and up. It’s dark but lit by lamposts. 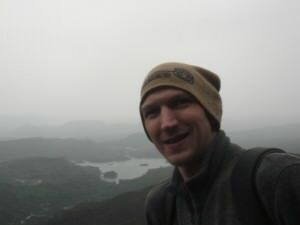 Hiking Adam’s Peak: Dark views like this are commonplace on the hike up at night. 5.30 am – This was supposed to be the time we got to the top of Adam’s Peak for sunrise but it was just misty, drizzly and wet so by 5.30 am it was still dark and drab. 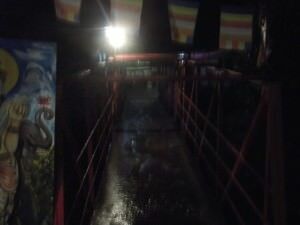 The difficult night time ascent to the top of Adam’s Peak. 6.30 am – We reached the top of Adam’s Peak! But there was no sunrise! All smiles for me and my Dad almost at the top of Adam’s Peak/Sri Pada in Sri Lanka. 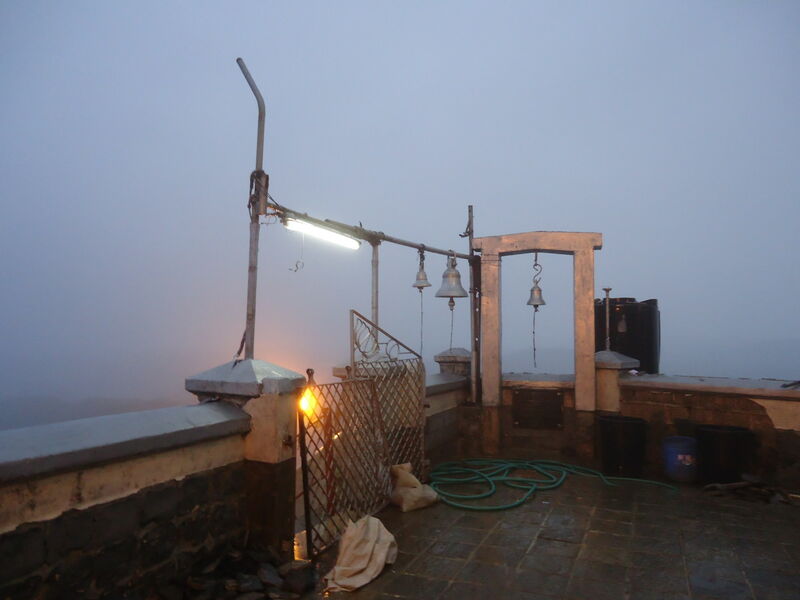 All we got was a misty view of the mountains and lots of pilgrims worshipping in the many rooms at the top. This is what the Peak of Adam’s Peak looks like at sunrise! Or should that be mistrise? You could hardly see a thing! We spent about half an hour at the top and then headed back down. It was a nice feeling to have reached the top and I hugged my Dad and said well done. The view at the top of Sri Pada – Adam’s Peak, Sri Lanka. 8.30 am – After a couple of hours hiking back down, we finally reached the more level part of the walk. 9.30 am – Walked back through the town of Dellhousie admiring the views. On the way back down – admiring the views and gazing up at how far we hiked. 10 am – Arrived back at the White House Hostel for breakfast. This was a magnificent achievement given the weather and the fact I hiked with my Dad. 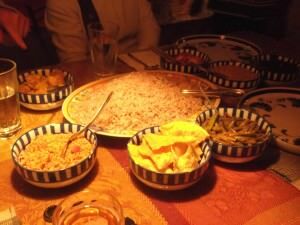 I loved it and it was great exercise for us, though ultimately a tiring experience. Fast walkers could go up and down in 4 hours I’d say. But we took it a bit easy and took about 7-8 hours. Including savouring the views on the way back down. My Dad walking through the mountain village of Dellhousie at the end of the hike. 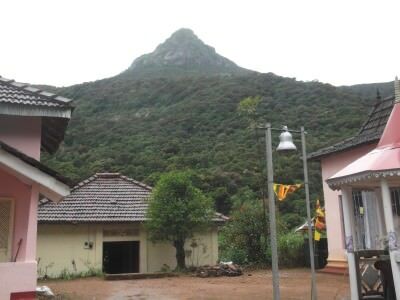 When is the best time to go Hiking to Adam’s Peak? 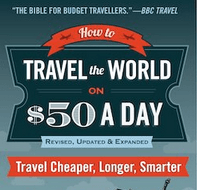 The pilgrimage season (yes there is such a thing!) starts in December on Poya Day and it runs until the Vesak Festival in May. This is the busiest time to do the hike. 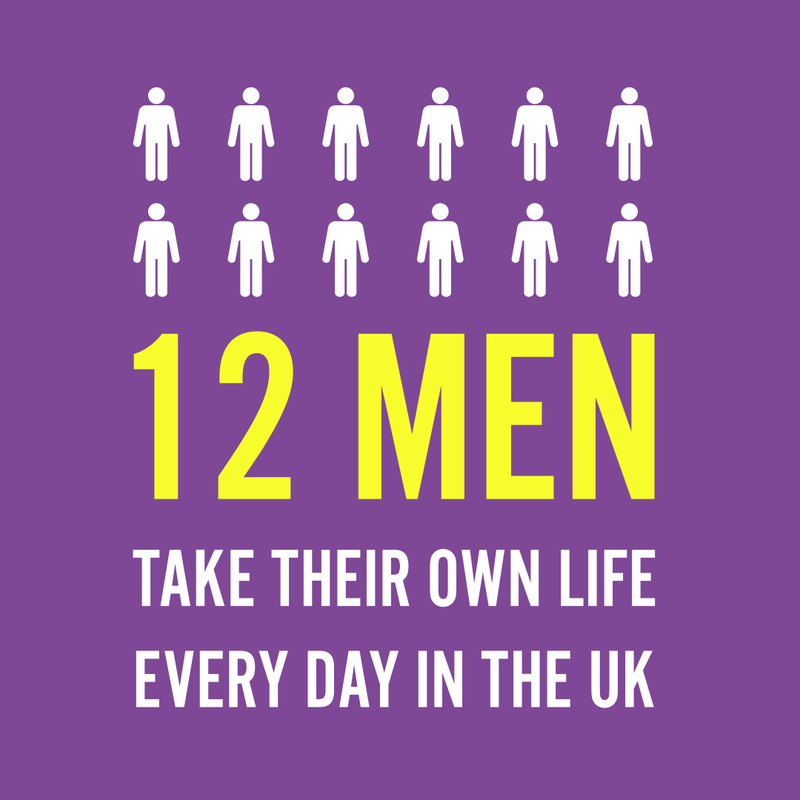 January and February are the busiest two months. We did the hike in February. Apparently for the rest of the year the temple at the top is rarely used and the path is not lit up so bear that in mond. Apparently on a clear day you can see Colombo, which is 65 kilometres west! 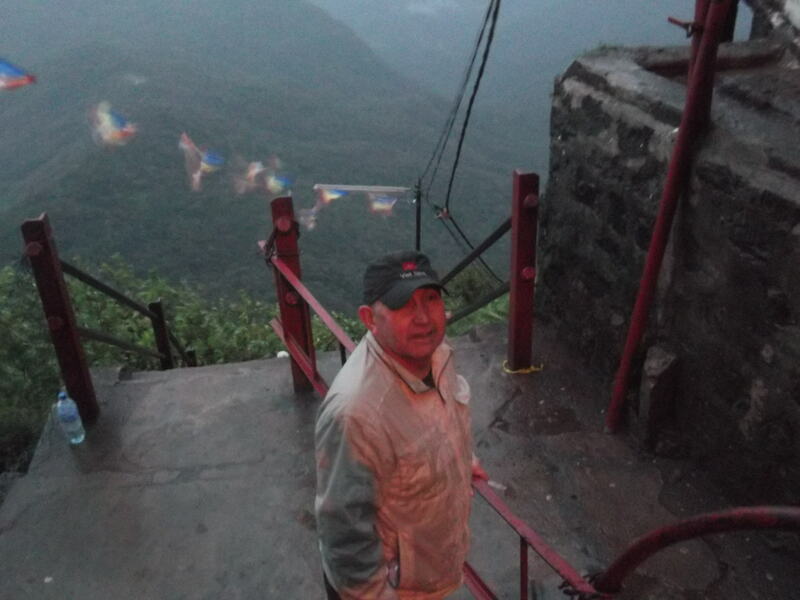 My Dad arrives at the top of Adam’s Peak!! Amazing!! Another pointer is don’t do the hike on a Poya Day! This is the busiest day of the year and you could take hours to get up and down because of the queues! It’s a total of just under 8 kilometres constant rising from leaving the hostel to the summit, and the same back down obviously. So just over 15 kilometres for the return. How many steps are there on the Hike? Over 5,000. 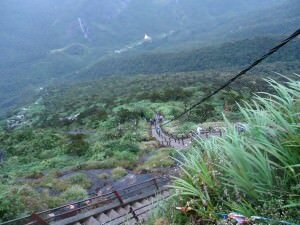 The estimates are 5,200 odd meaning to go up and back down you will have ascended or descended 10,400 steps. 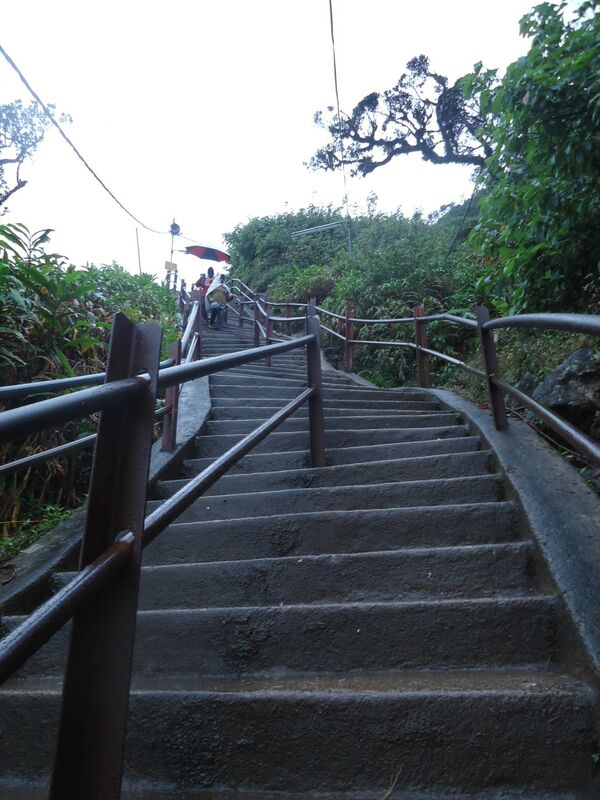 There are over 10,000 steps on the Adam’s Peak hike up and down…get ready for it! Be ready for lots of music and prayers on the way up! My Dad and I had a real laugh at the music and we joked that we should have brought a ghetto blaster with us with a bit of Bob Dylan or something. If you watch my videos below, some of them have the music in the background! The music is loud and indecipherable! Get ready for music pumping out of all these Buddhist shrines on the way up!!! It’s loud and indecipherable! 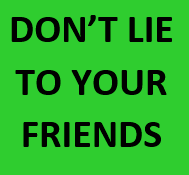 We had heard rumours of muggings and thefts but once you’ve done the hike you will struggle to believe that as everyone seems friendly. Other dangers are the steps – be careful walking up and down. Mosquitos and leeches are also an issue, but as the weather was so bad on our hike we didn’t come across any of these. Just take care and you’ll be fine. 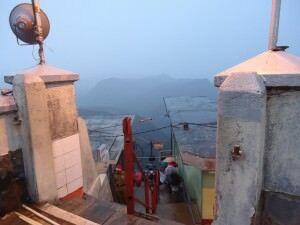 It’s a sacred mountain and various stories have developed over the years, here’s the one I believe – it’s where Adam came down to earth from heaven and landed. Yes, Adam from Adam and Eve – Adam from the Bible and all that! 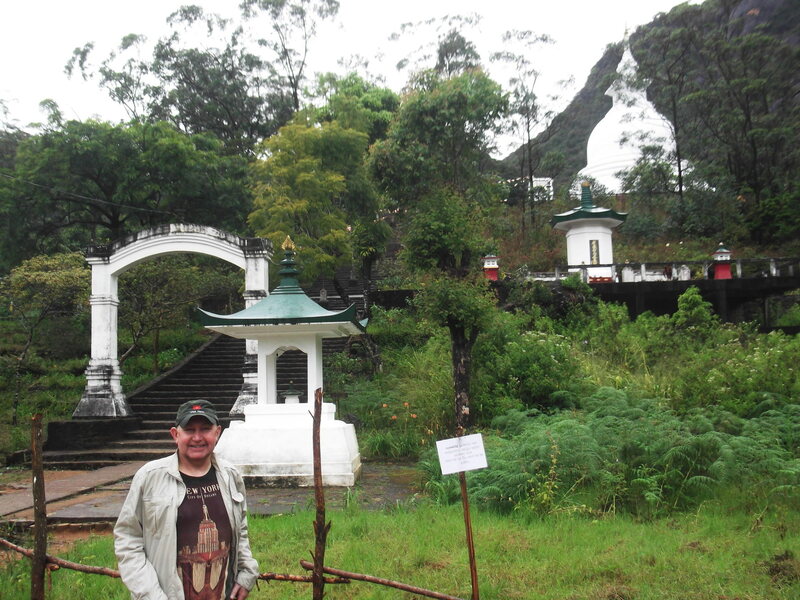 He landed onto planet earth here at Adam’s Peak in Sri Lanka and the hike is now a pilgrimage walk. Another theory and the reason for the name Sri Pada (sacred footprint) is because there was a footprint left here by the Buddha before he headed up into paradise! My Dad and I at the top of Adam’s Peak though due to the weather you wouldn’t have a clue where we were! 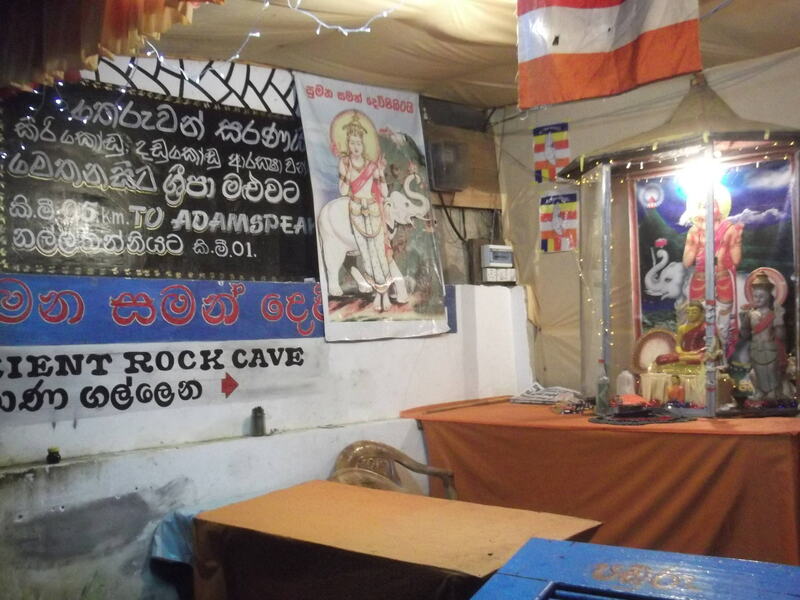 At the top of Adam’s Peak there are shelters to rest in. These were all built by previous Kings so that the pilgrims could rest here. 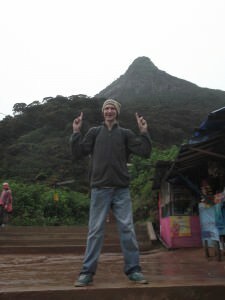 I read that pilgrims have been doing the upward hike to Adam’s Peak for over 1,000 years. Staring down at the world from the top of Adam’s Peak in Sri Lanka. I remember thinking it might have been hard on my Dad’s legs and stamina to make the hike to the top. He surpassed himself and I now think that the pilgrimage should make him stronger and give him good health, strength and courage for life. It was a remarkable achievement for my Dad. I really believe it. 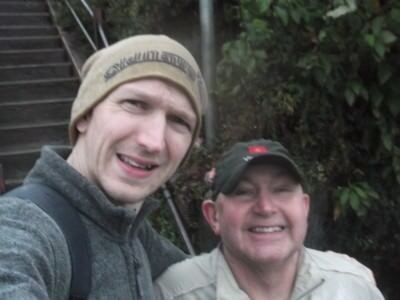 With my Dad hiking to the top of Adam’s Peak, Sri Lanka in 2013. Yes this is a bit more of a personal blog post today rather than simply a guide to hiking to Adam’s Peak. But my Dad and I have some great memories and this one stands out now. 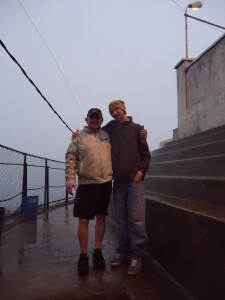 The day my Dad and I hiked to the top of Adam’s Peak! We did it, amazing! I’m dedicating this post to my Dad, Joe Blair who is reading online somewhere. Thanks Dad, Love from Jonny and see you soon. 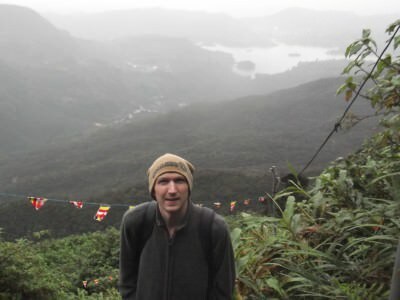 To the rest of you – go hiking to Adam’s Peak and safe travels! 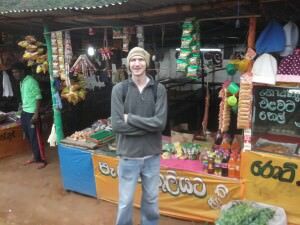 This entry was posted in Adams Peak, Asia, Destinations, Hiking, Sri Lanka. Bookmark the permalink. Wow, it’s a fun activity. exploring, hiking and camping in the wild is a challenge and satisfaction. and you do it in one of the most exotic locations in the world, Sri Lanka. very interesting. salute. nice post.